Every one of us depends on the process of urination for the removal of certain waste products in the body. 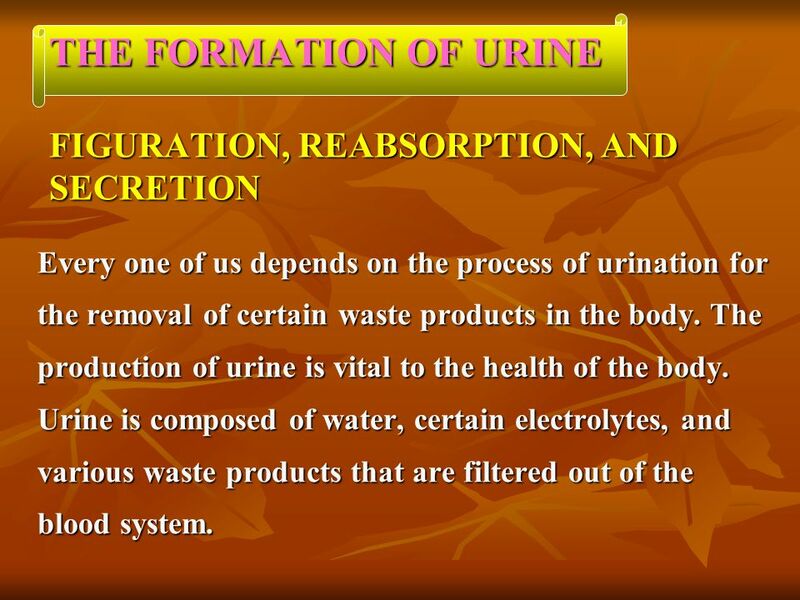 The production of urine is vital to the health of the body. 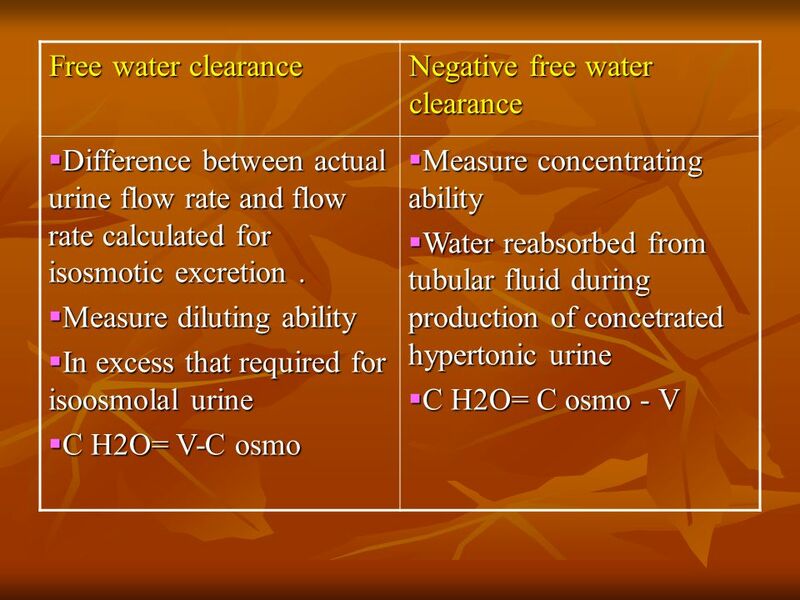 Urine is composed of water, certain electrolytes, and various waste products that are filtered out of the blood system. 7 Remember, as the blood flows through the body, wastes resulting from the metabolism of foodstuffs in the body cells are deposited into the bloodstream, and this waste must be disposed of in some way. 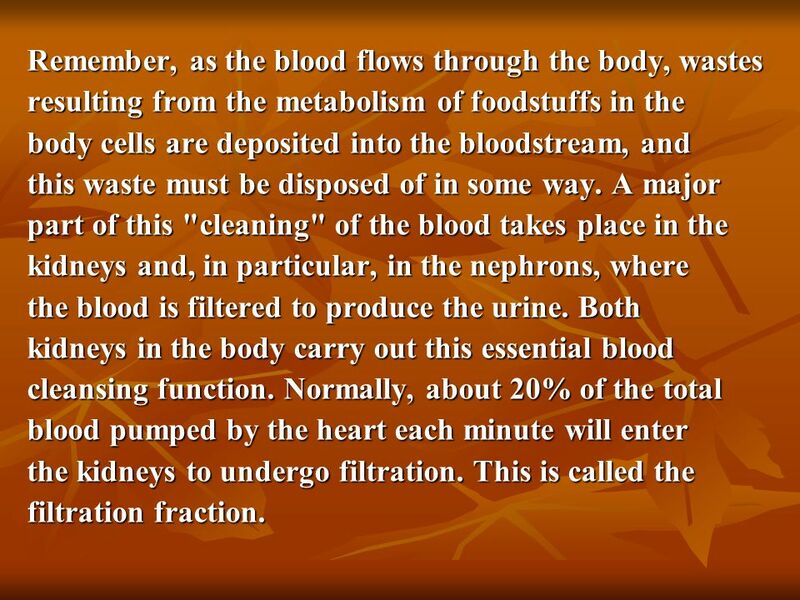 A major part of this "cleaning" of the blood takes place in the kidneys and, in particular, in the nephrons, where the blood is filtered to produce the urine. Both kidneys in the body carry out this essential blood cleansing function. Normally, about 20% of the total blood pumped by the heart each minute will enter the kidneys to undergo filtration. This is called the filtration fraction. 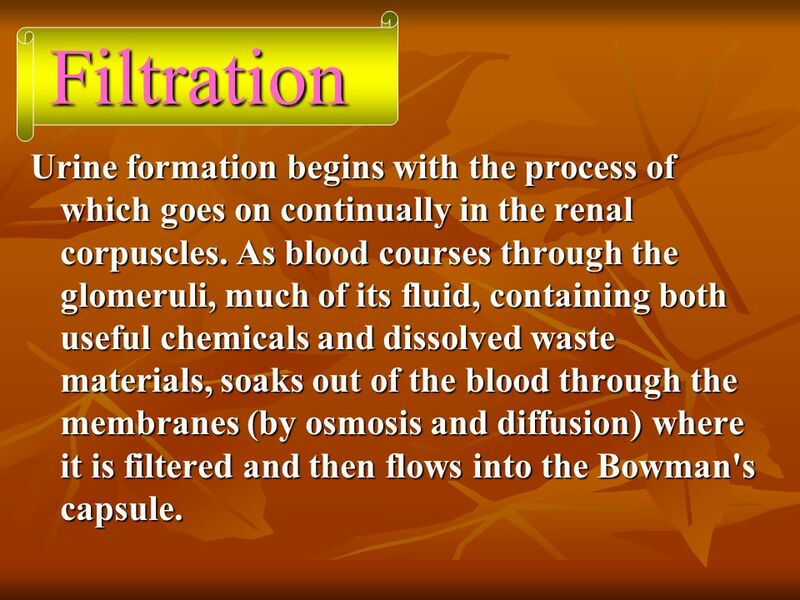 8 Filtration Urine formation begins with the process of which goes on continually in the renal corpuscles. As blood courses through the glomeruli, much of its fluid, containing both useful chemicals and dissolved waste materials, soaks out of the blood through the membranes (by osmosis and diffusion) where it is filtered and then flows into the Bowman's capsule. This process is called glomerular filtration. 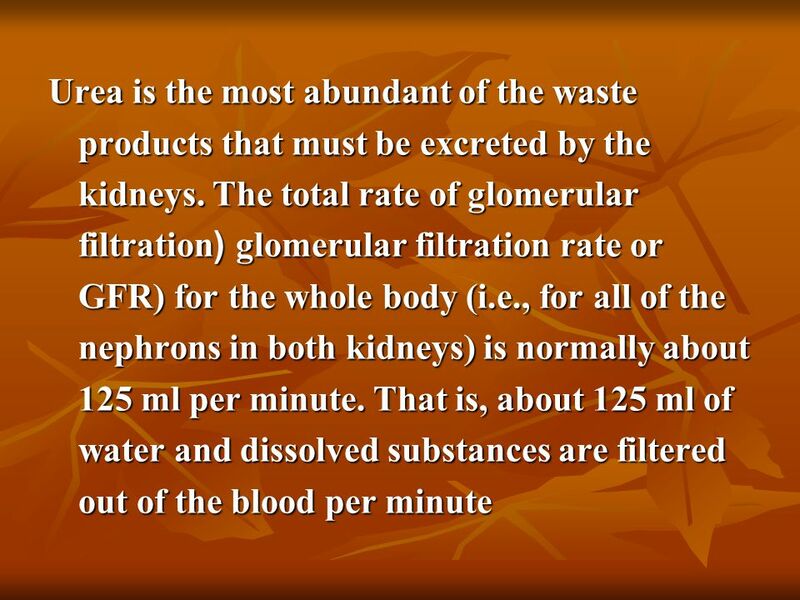 The water, waste products, salt, glucose, and other chemicals that have been filtered out of the blood are known collectively as glomerular filtrate. 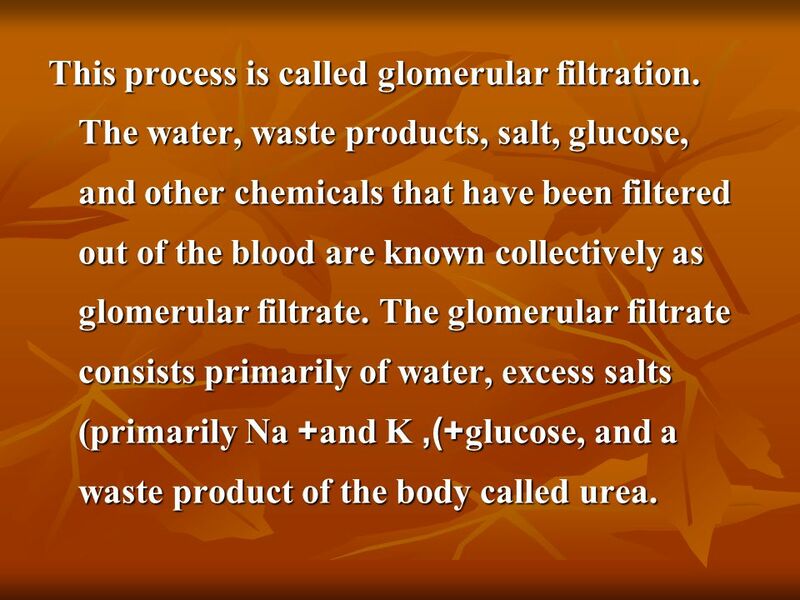 The glomerular filtrate consists primarily of water, excess salts (primarily Na+ and K+), glucose, and a waste product of the body called urea. 10 Urea is formed in the body to eliminate the very toxic ammonia products that are formed in the liver from amino acids. 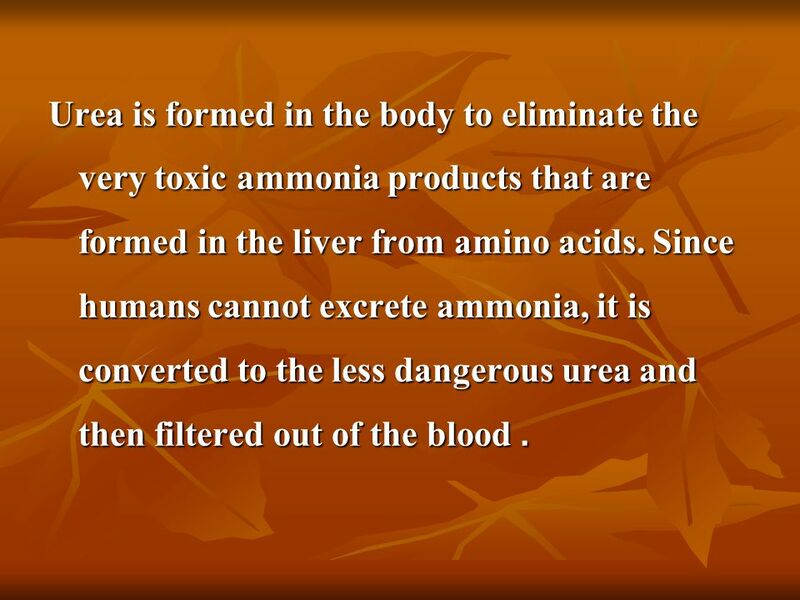 Since humans cannot excrete ammonia, it is converted to the less dangerous urea and then filtered out of the blood. 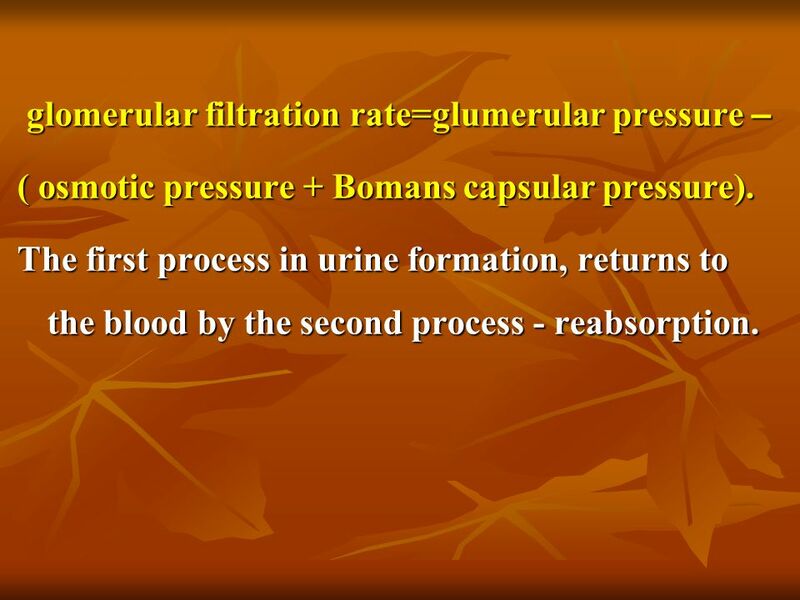 ( osmotic pressure + Bomans capsular pressure). 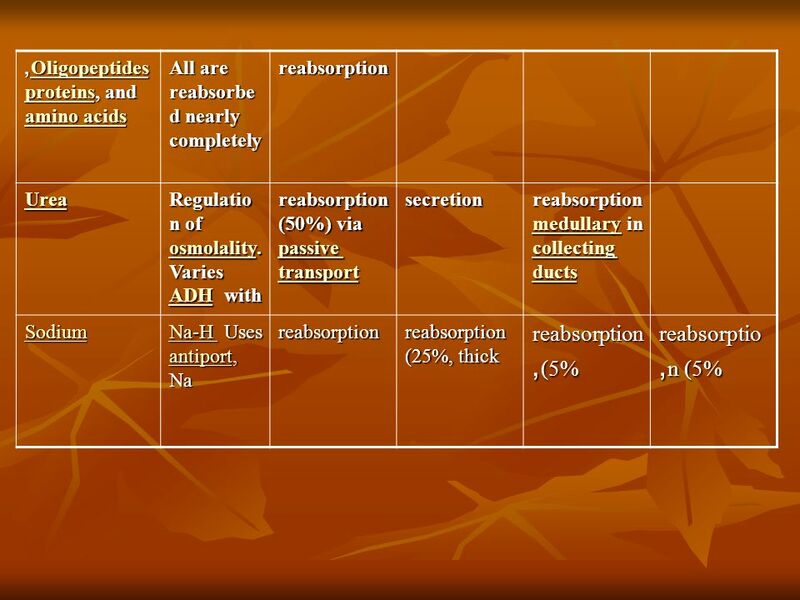 The first process in urine formation, returns to the blood by the second process - reabsorption. 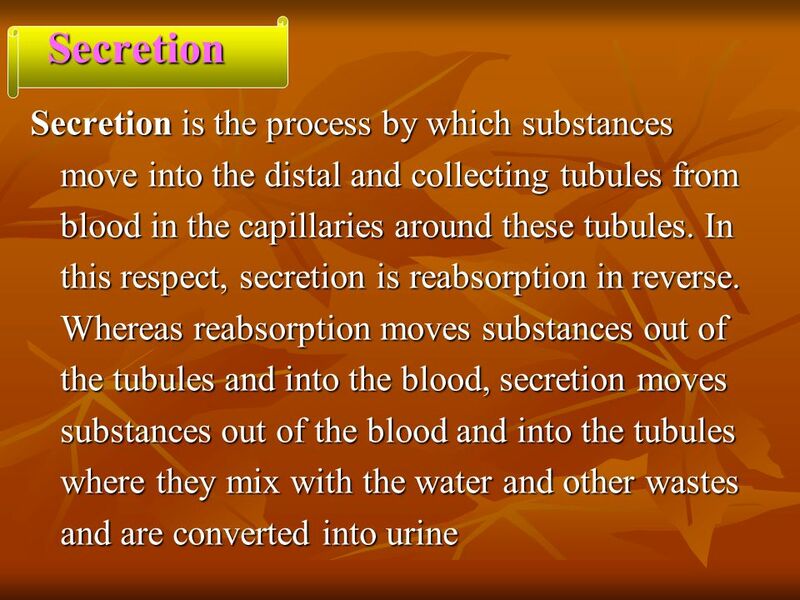 13 Reabsorption Reabsorption, by definition, is the movement of substances out of the renal tubules back into the blood capillaries located around the tubules. 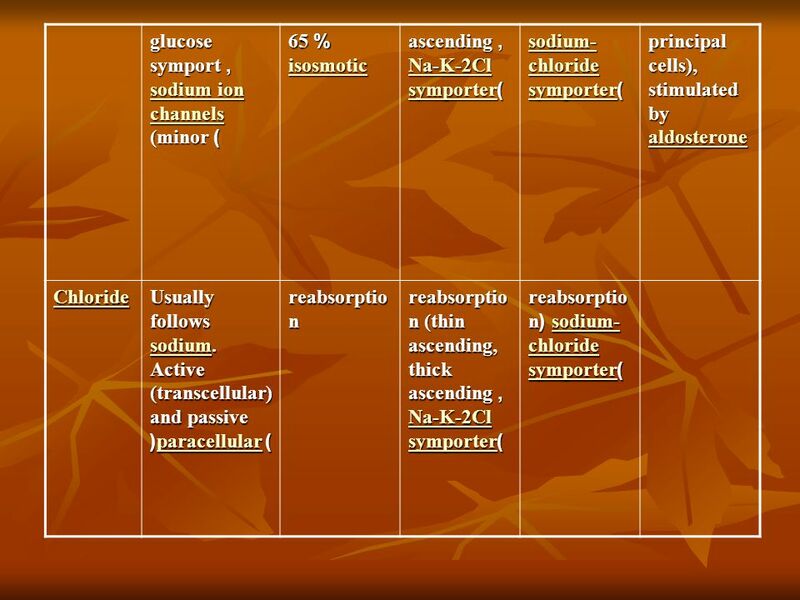 Substances reabsorbed are water, glucose and other nutrients, and sodium (Na+) and other ions. 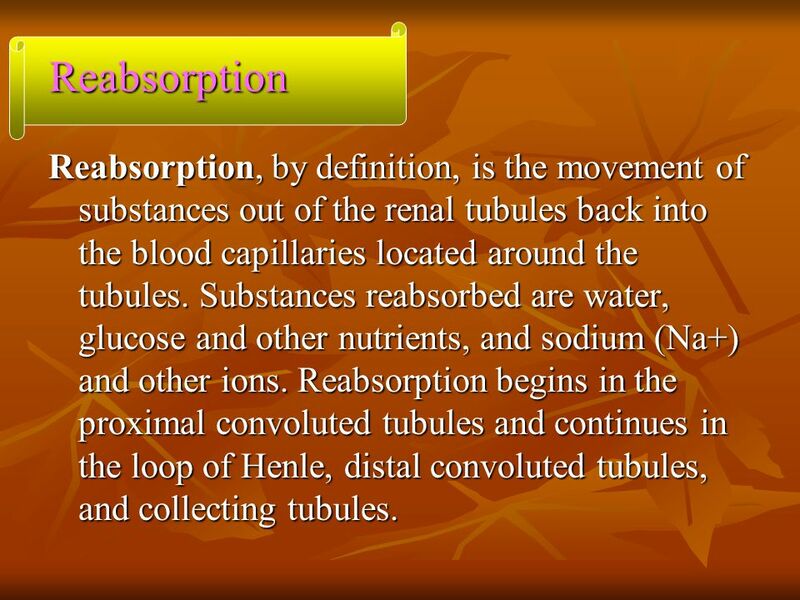 Reabsorption begins in the proximal convoluted tubules and continues in the loop of Henle, distal convoluted tubules, and collecting tubules. 14 Large amounts of water - more than 178 liters per day - are reabsorbed back into the bloodstream from the proximal tubules because the physical forces acting on the water in these tubules actually push most of the water back into the blood capillaries. 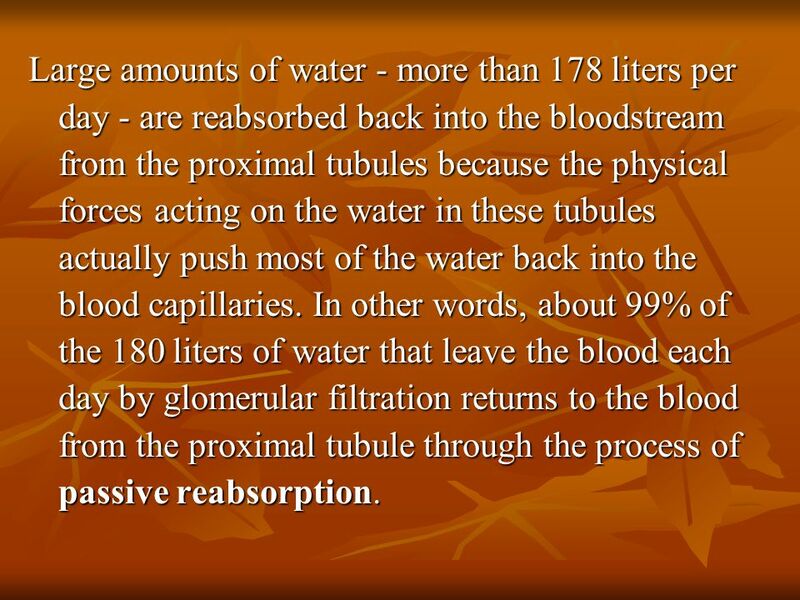 In other words, about 99% of the 180 liters of water that leave the blood each day by glomerular filtration returns to the blood from the proximal tubule through the process of passive reabsorption. 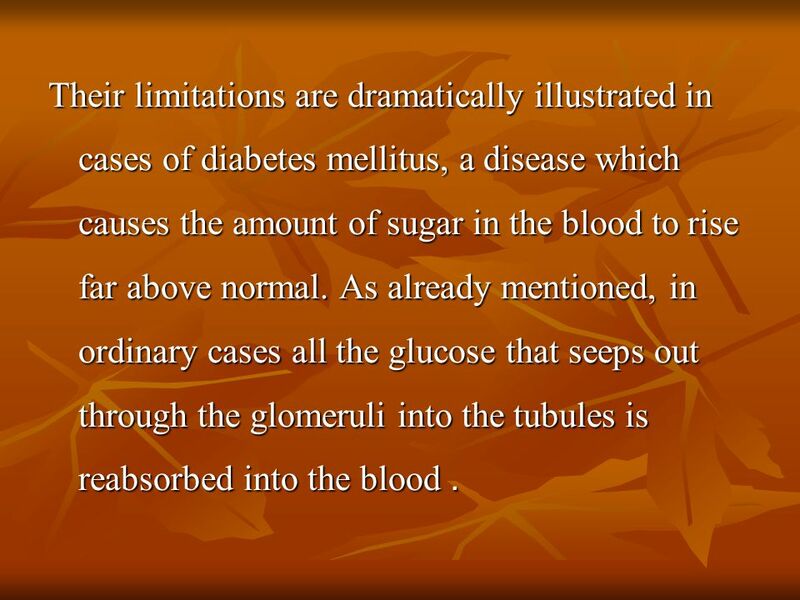 16 Their limitations are dramatically illustrated in cases of diabetes mellitus, a disease which causes the amount of sugar in the blood to rise far above normal. 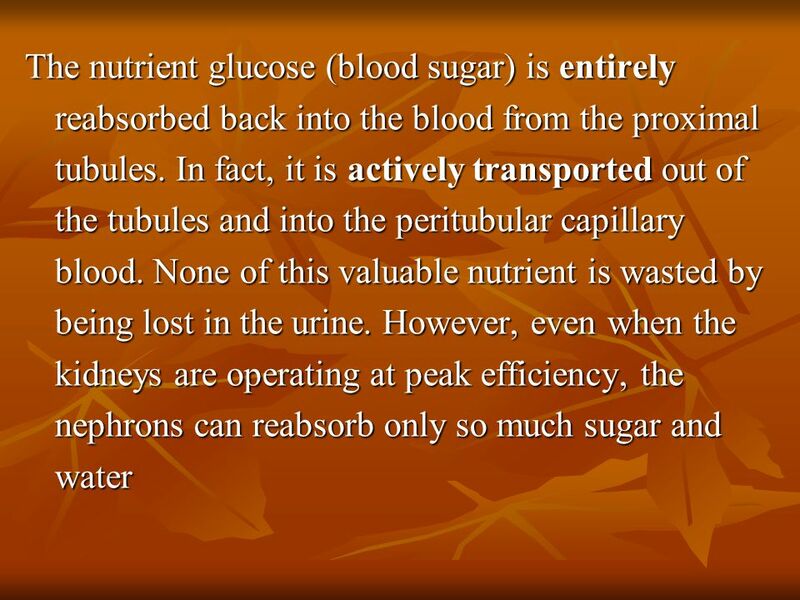 As already mentioned, in ordinary cases all the glucose that seeps out through the glomeruli into the tubules is reabsorbed into the blood. 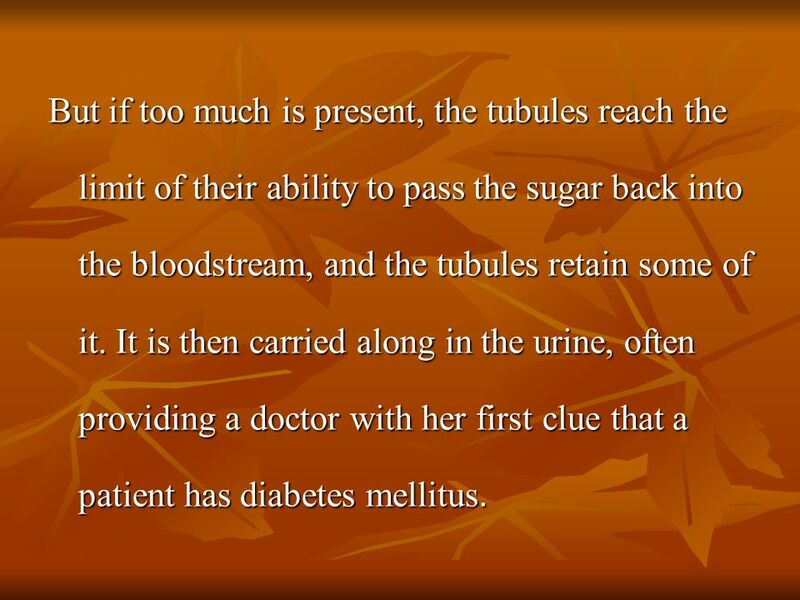 17 But if too much is present, the tubules reach the limit of their ability to pass the sugar back into the bloodstream, and the tubules retain some of it. It is then carried along in the urine, often providing a doctor with her first clue that a patient has diabetes mellitus. 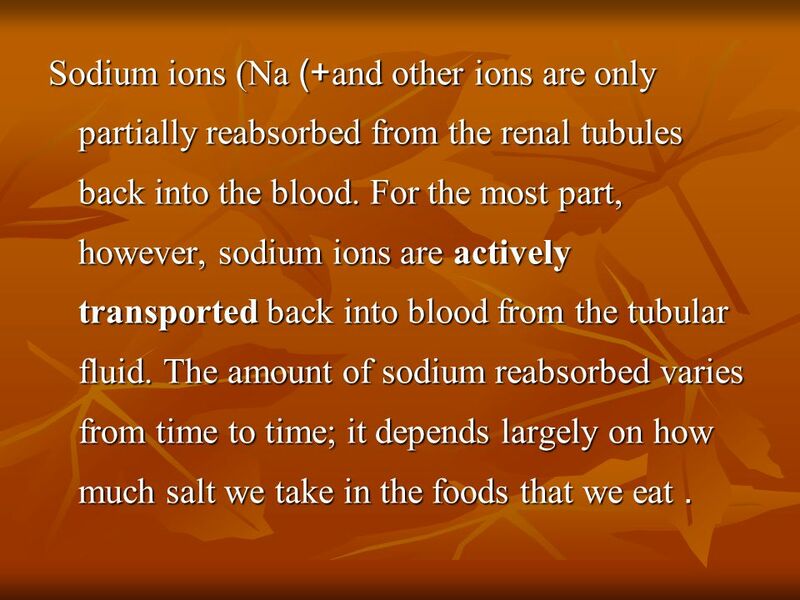 18 Sodium ions (Na+) and other ions are only partially reabsorbed from the renal tubules back into the blood. For the most part, however, sodium ions are actively transported back into blood from the tubular fluid. The amount of sodium reabsorbed varies from time to time; it depends largely on how much salt we take in the foods that we eat. 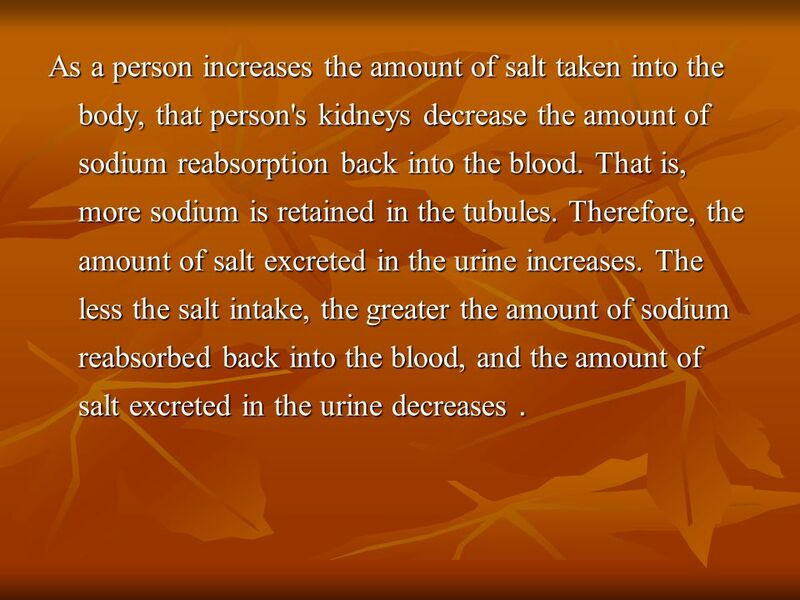 19 As a person increases the amount of salt taken into the body, that person's kidneys decrease the amount of sodium reabsorption back into the blood. That is, more sodium is retained in the tubules. Therefore, the amount of salt excreted in the urine increases. 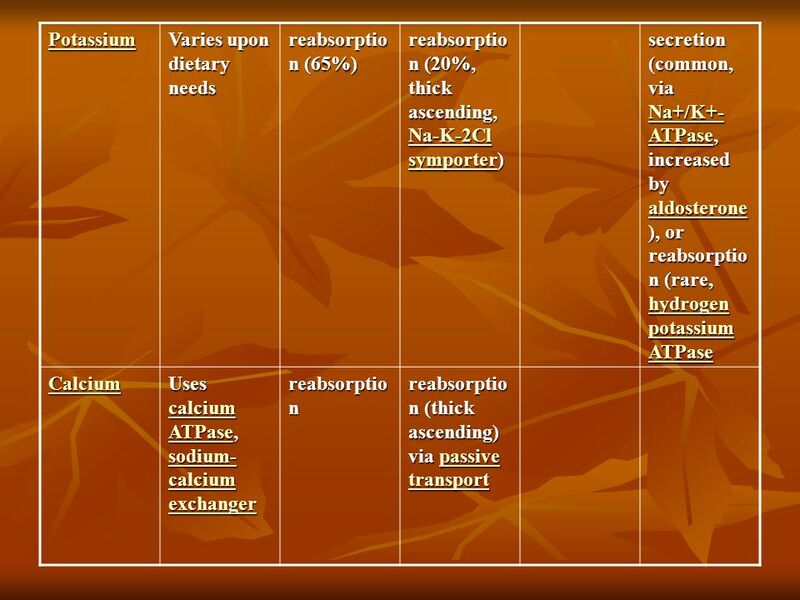 The less the salt intake, the greater the amount of sodium reabsorbed back into the blood, and the amount of salt excreted in the urine decreases. 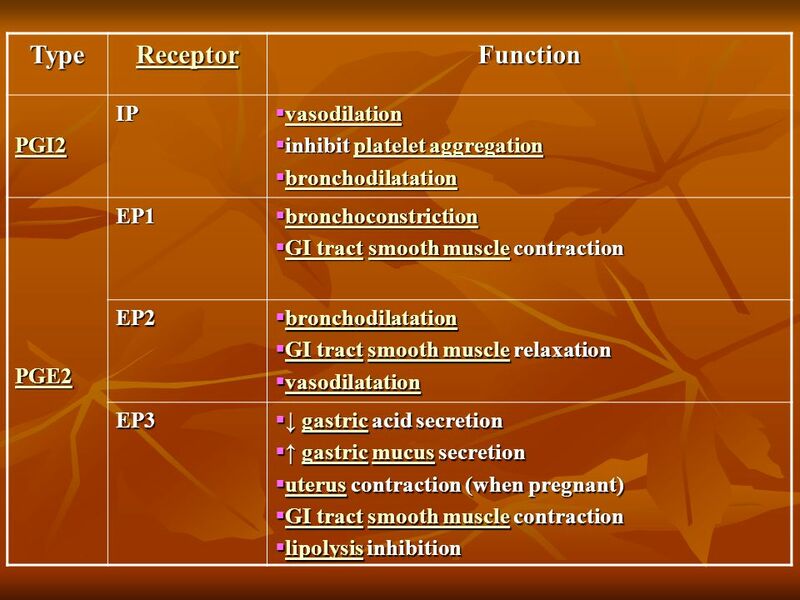 21 These substances are secreted through either an active transport mechanism or as a result of diffusion across the membrane. 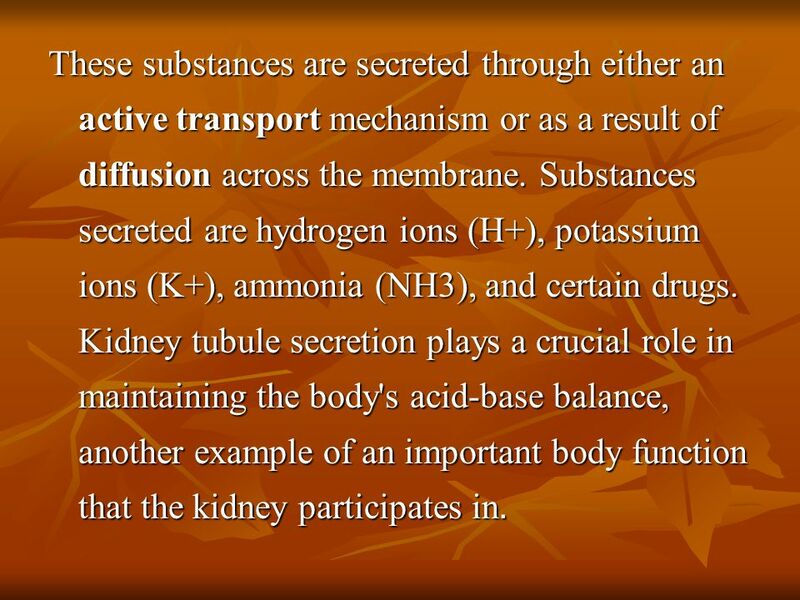 Substances secreted are hydrogen ions (H+), potassium ions (K+), ammonia (NH3), and certain drugs. 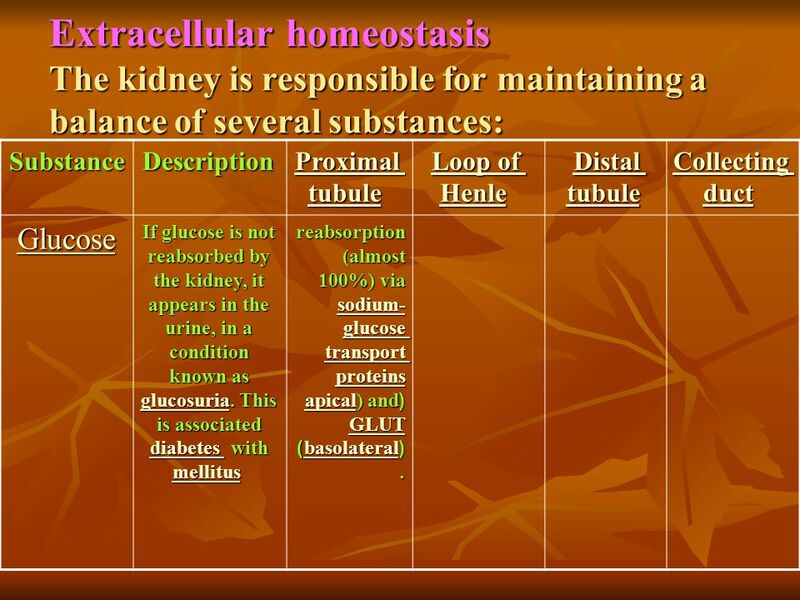 Kidney tubule secretion plays a crucial role in maintaining the body's acid-base balance, another example of an important body function that the kidney participates in. The body is very sensitive to its pH level. Outside the range of pH that is compatible with life, proteins are denatured and digested, enzymes lose their ability to function, and the body is unable to sustain itself. 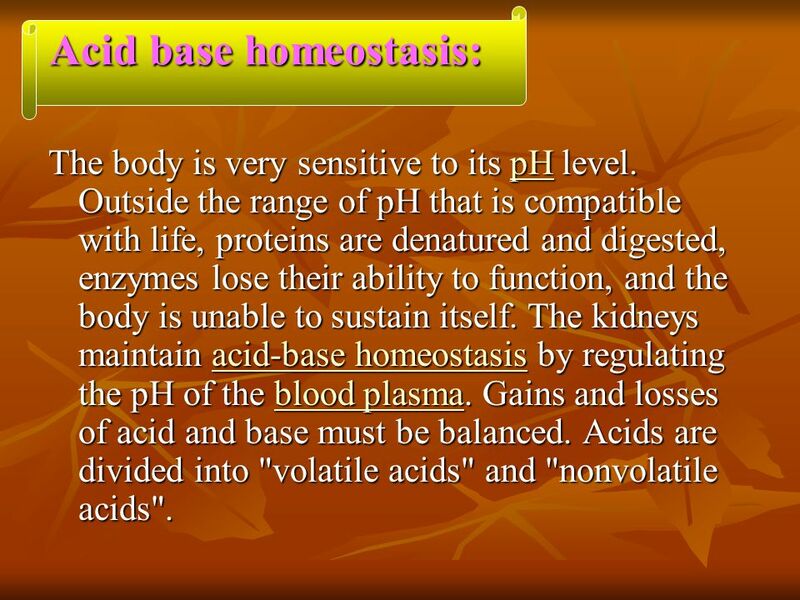 The kidneys maintain acid-base homeostasis by regulating the pH of the blood plasma. Gains and losses of acid and base must be balanced. 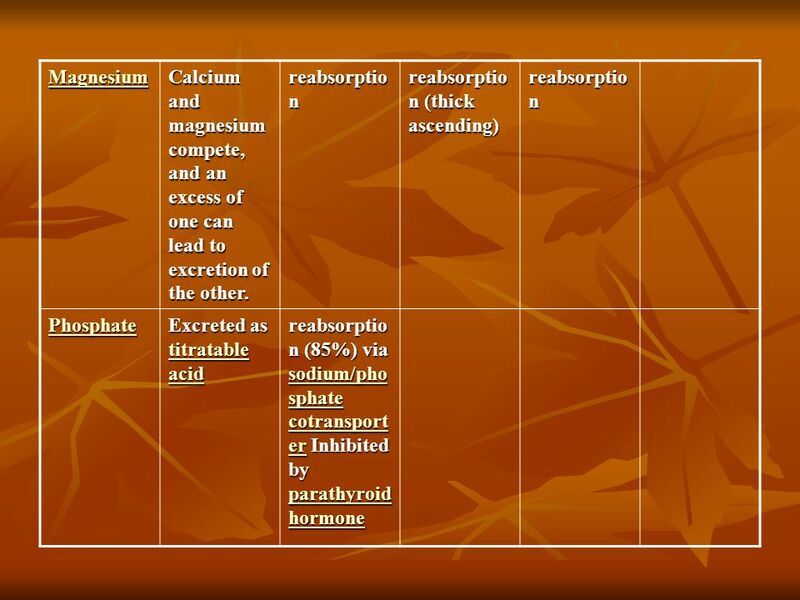 Acids are divided into "volatile acids" and "nonvolatile acids". 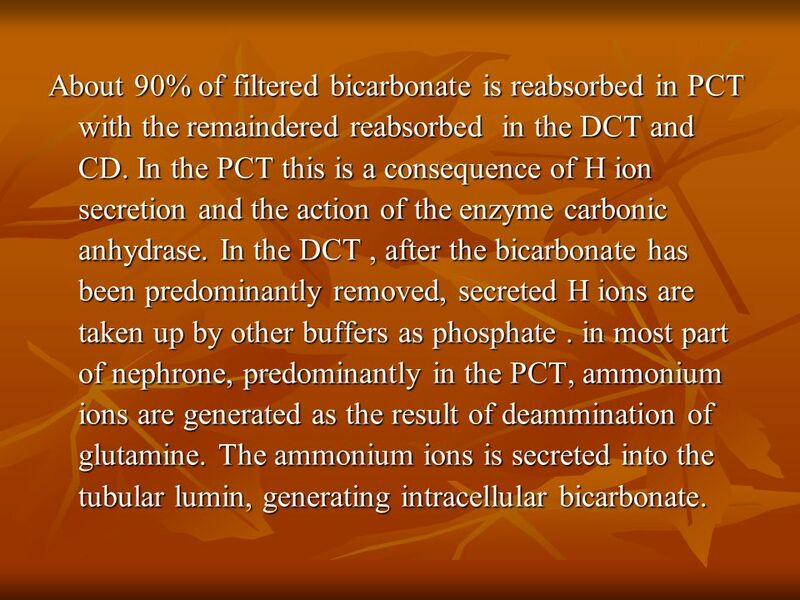 29 About 90% of filtered bicarbonate is reabsorbed in PCT with the remaindered reabsorbed in the DCT and CD. In the PCT this is a consequence of H ion secretion and the action of the enzyme carbonic anhydrase. In the DCT , after the bicarbonate has been predominantly removed, secreted H ions are taken up by other buffers as phosphate . in most part of nephrone, predominantly in the PCT, ammonium ions are generated as the result of deammination of glutamine. The ammonium ions is secreted into the tubular lumin, generating intracellular bicarbonate. 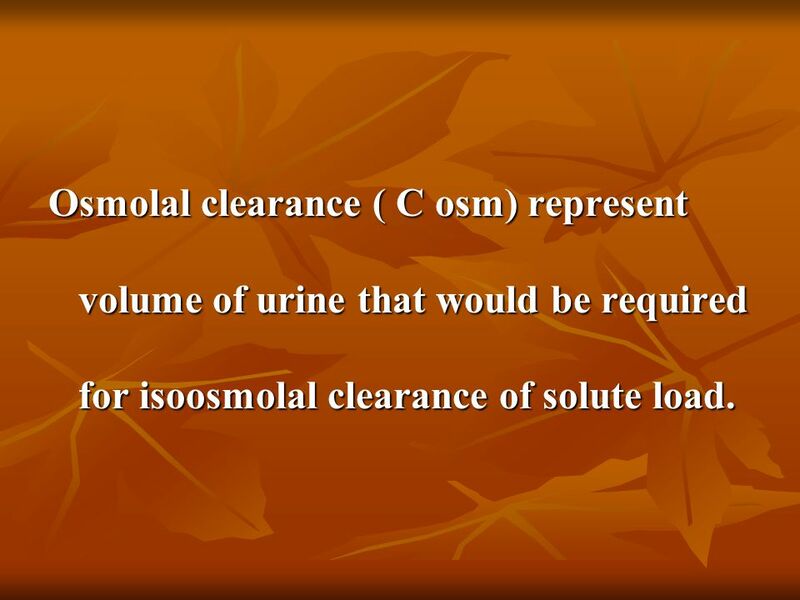 31 The minimum urine volume is determined by solute load to be excreted and may be as low as 400 ml/ d.
The maximum urine volume is determined by water load to be excreted and may be as mnch as L/ d.
32 Osmolal clearance ( C osm) represent volume of urine that would be required for isoosmolal clearance of solute load. 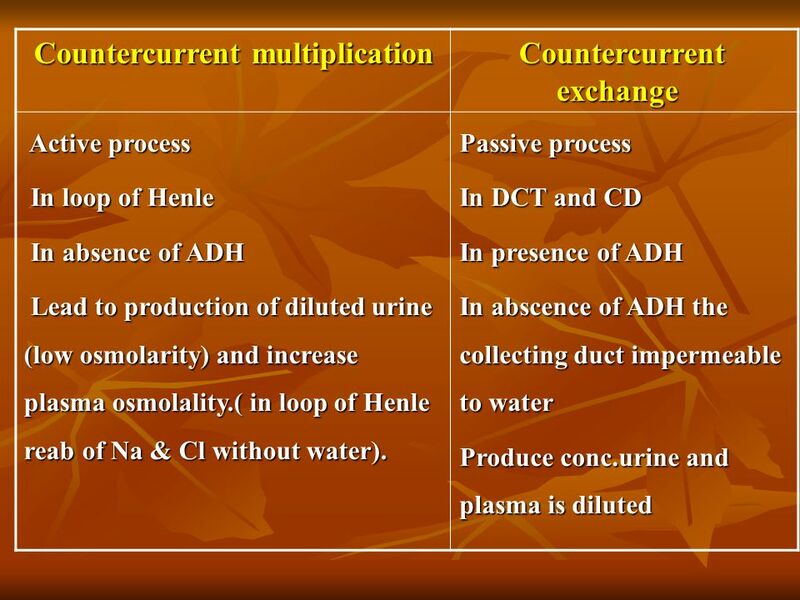 Passive process In DCT and CD In presence of ADH In abscence of ADH the collecting duct impermeable to water Produce conc.urine and plasma is diluted Active process In loop of Henle In absence of ADH Lead to production of diluted urine (low osmolarity) and increase plasma osmolality. 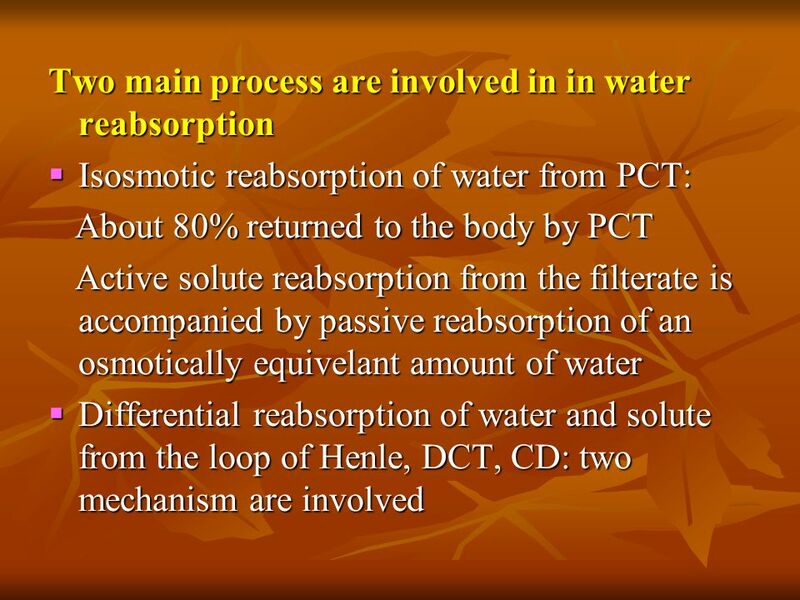 ( in loop of Henle reab of Na & Cl without water). 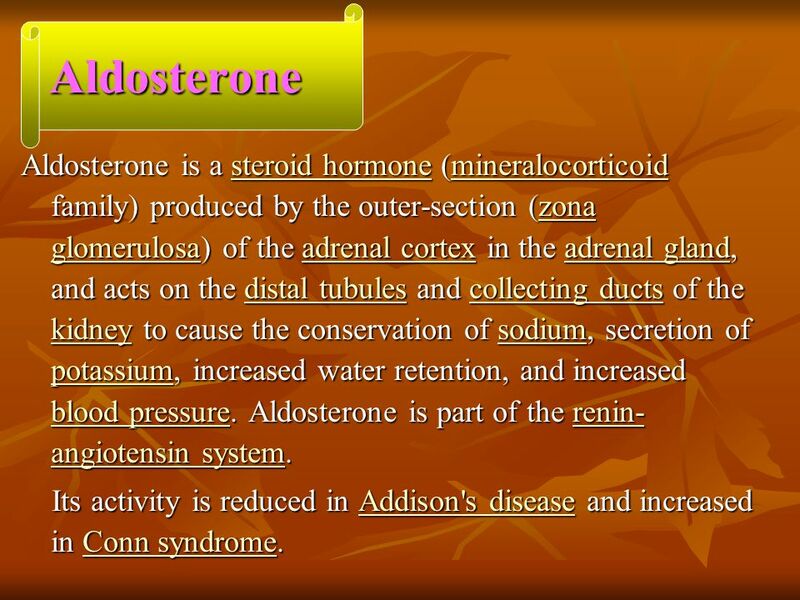 37 Aldosterone Aldosterone is a steroid hormone (mineralocorticoid family) produced by the outer-section (zona glomerulosa) of the adrenal cortex in the adrenal gland, and acts on the distal tubules and collecting ducts of the kidney to cause the conservation of sodium, secretion of potassium, increased water retention, and increased blood pressure. 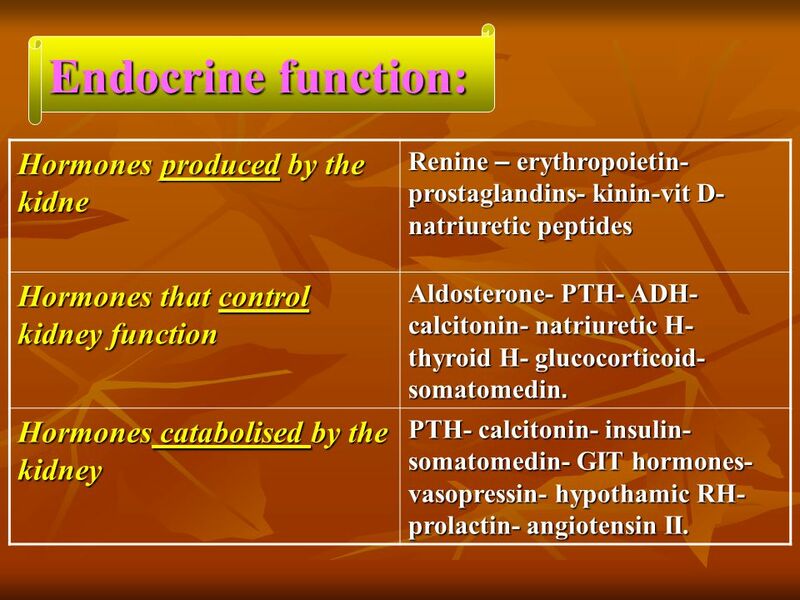 Aldosterone is part of the renin-angiotensin system. 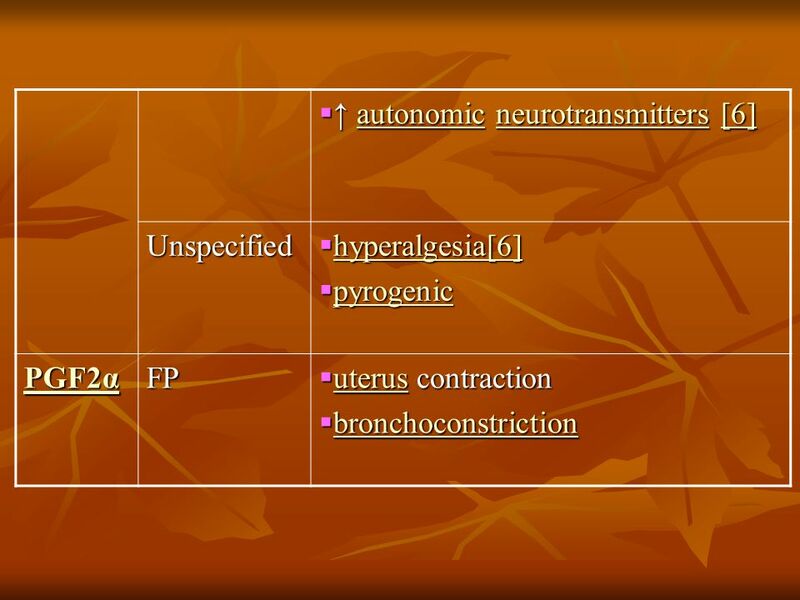 Its activity is reduced in Addison's disease and increased in Conn syndrome. 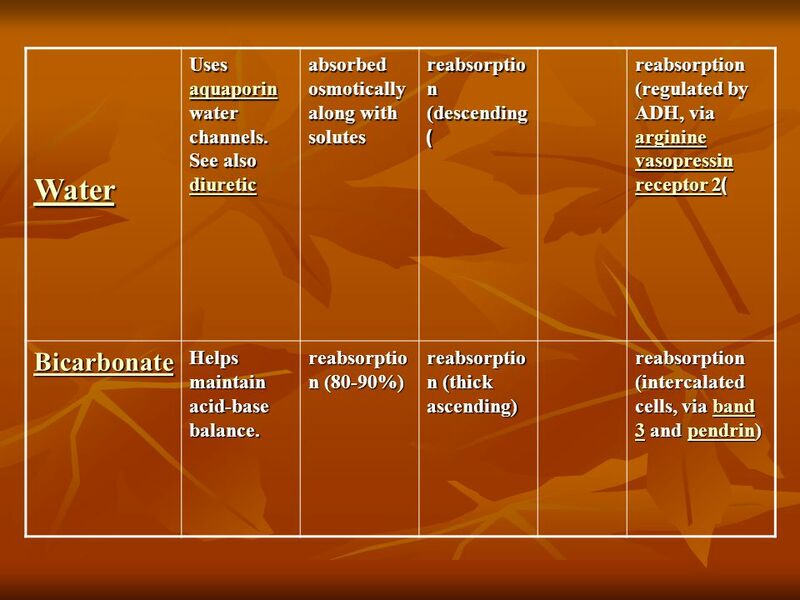 38 vasopressin Arginine vasopressin (AVP), also known as vasopressin, argipressin or antidiuretic hormone (ADH), is a hormone found in most mammals, including humans. Vasopressin is a peptide hormone. It is derived from a preprohormone precursor that is synthesized in the hypothalamus and stored in vesicles at the posterior pituitary. 39 vasopressin Arginine vasopressin (AVP), also known as vasopressin, argipressin or antidiuretic hormone (ADH), is a hormone found in most mammals, including humans. 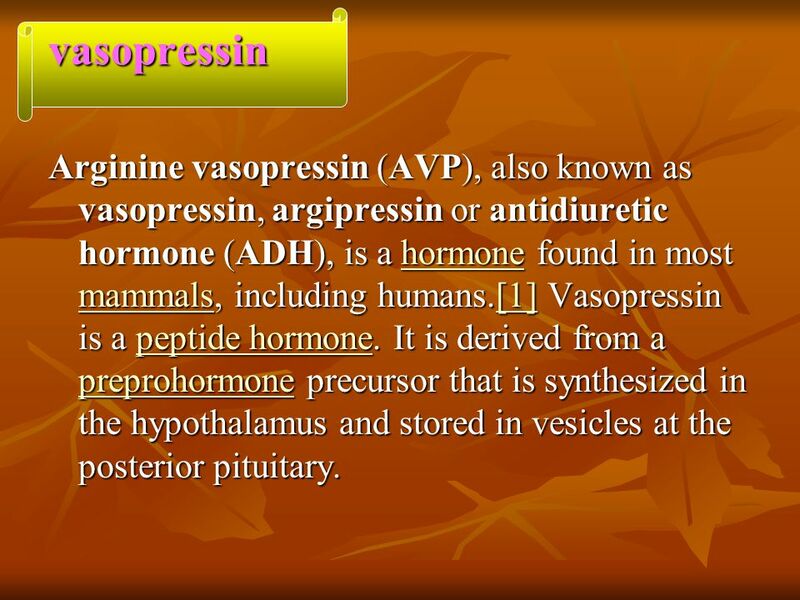 Vasopressin is a peptide hormone. It is derived from a preprohormone precursor that is synthesized in the hypothalamus and stored in vesicles at the posterior pituitary. 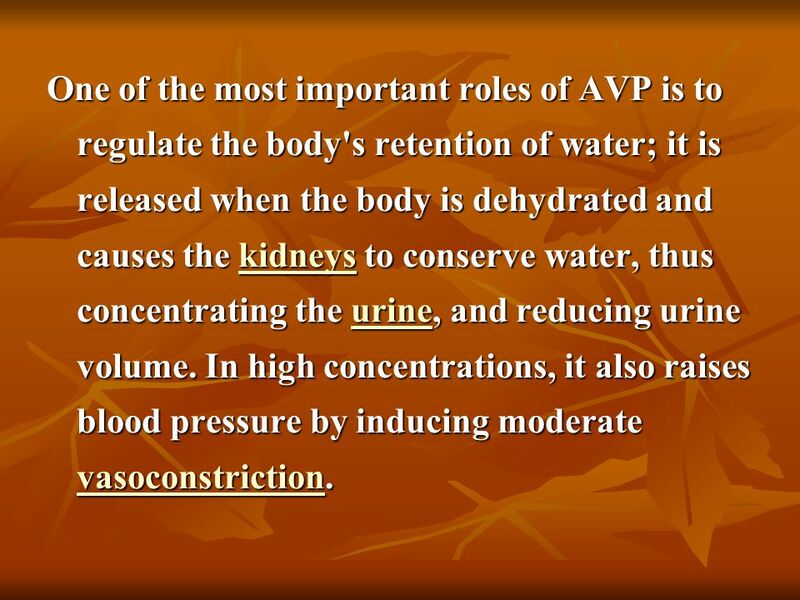 40 One of the most important roles of AVP is to regulate the body's retention of water; it is released when the body is dehydrated and causes the kidneys to conserve water, thus concentrating the urine, and reducing urine volume. In high concentrations, it also raises blood pressure by inducing moderate vasoconstriction. 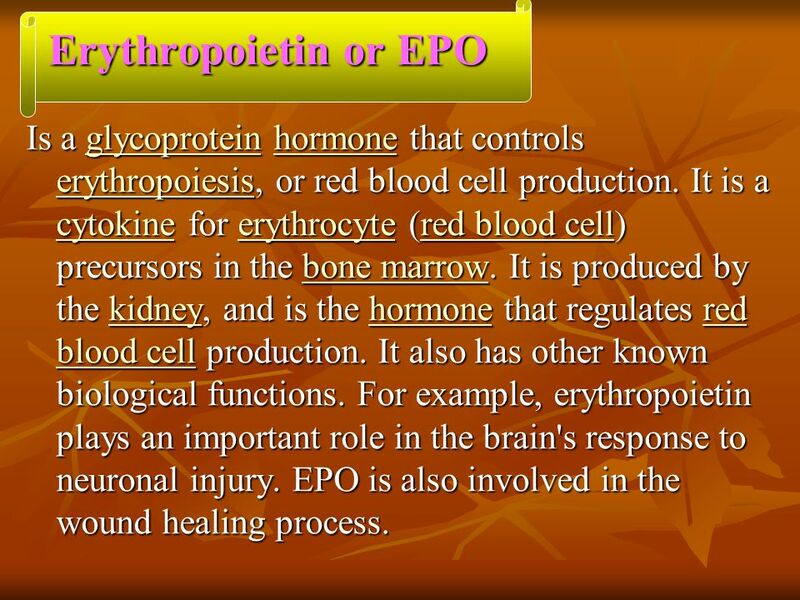 42 Erythropoietin or EPO Is a glycoprotein hormone that controls erythropoiesis, or red blood cell production. It is a cytokine for erythrocyte (red blood cell) precursors in the bone marrow. 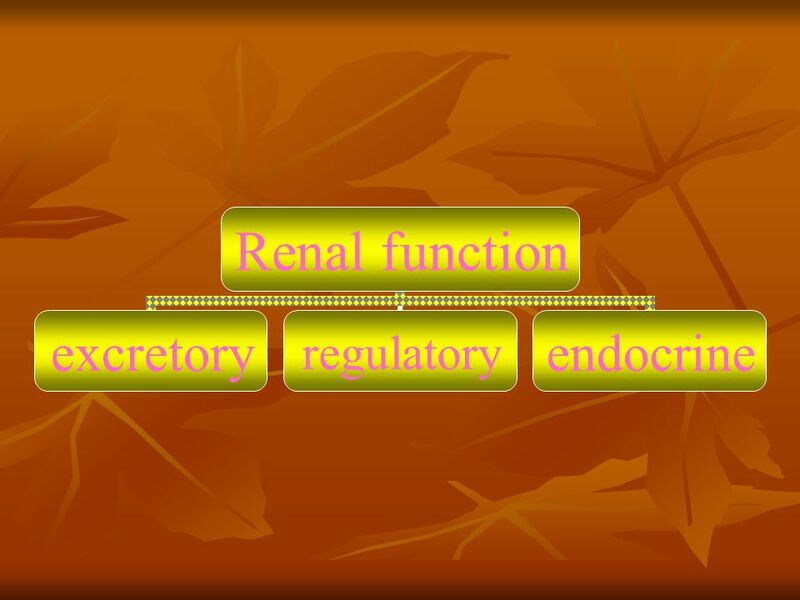 It is produced by the kidney, and is the hormone that regulates red blood cell production. It also has other known biological functions. For example, erythropoietin plays an important role in the brain's response to neuronal injury. EPO is also involved in the wound healing process. 43 An intermediate is created by phospholipase-A2, then passed into one of either the cyclooxygenase pathway or the lipoxygenase pathway to form either prostaglandin and thromboxane or leukotriene. 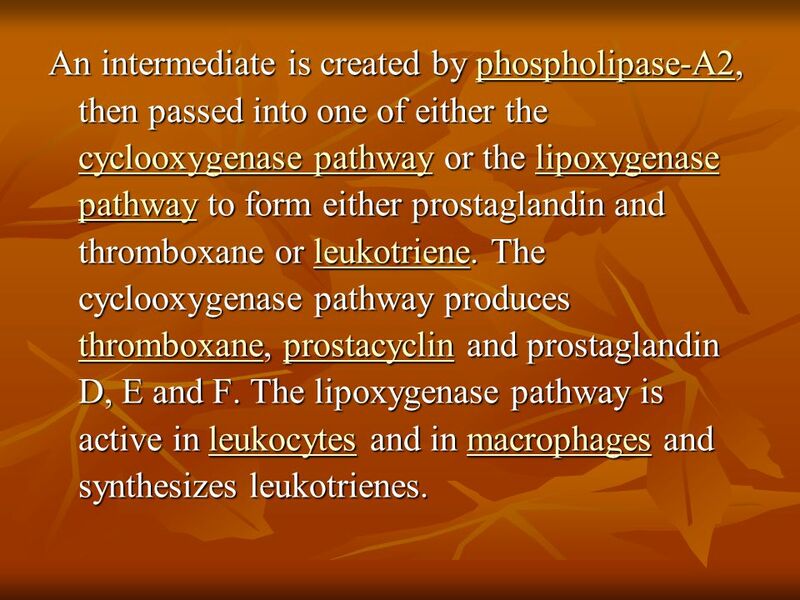 The cyclooxygenase pathway produces thromboxane, prostacyclin and prostaglandin D, E and F. The lipoxygenase pathway is active in leukocytes and in macrophages and synthesizes leukotrienes. 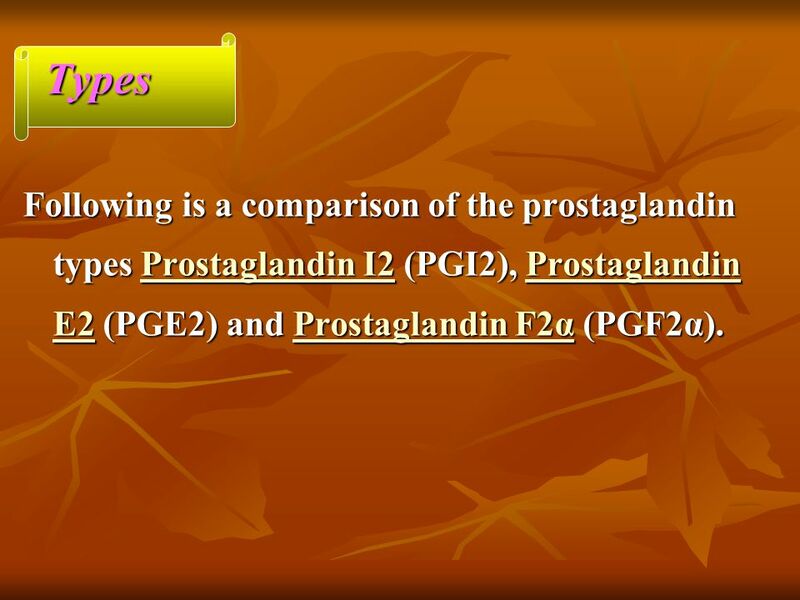 44 Types Following is a comparison of the prostaglandin types Prostaglandin I2 (PGI2), Prostaglandin E2 (PGE2) and Prostaglandin F2α (PGF2α). Cholecalciferol, (which is an inactive, unhydroxylated form of vitamin D3) Calcidiol (also called 25-hydroxyvitamin D3), which is the form measured in the blood to assess vitamin D status Calcitriol (also called 1,25-dihydroxyvitamin D3), which is the active form of D3. 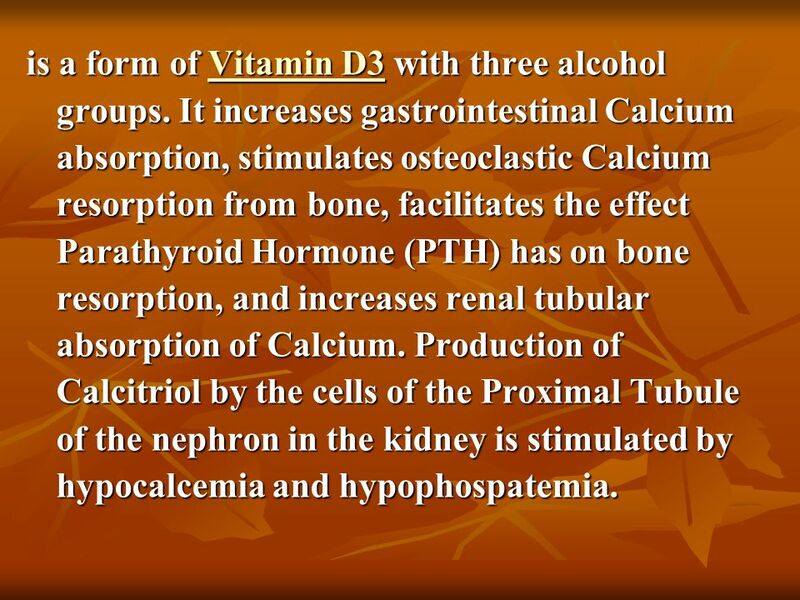 is a form of Vitamin D3 with three alcohol groups. It increases gastrointestinal Calcium absorption, stimulates osteoclastic Calcium resorption from bone, facilitates the effect Parathyroid Hormone (PTH) has on bone resorption, and increases renal tubular absorption of Calcium. 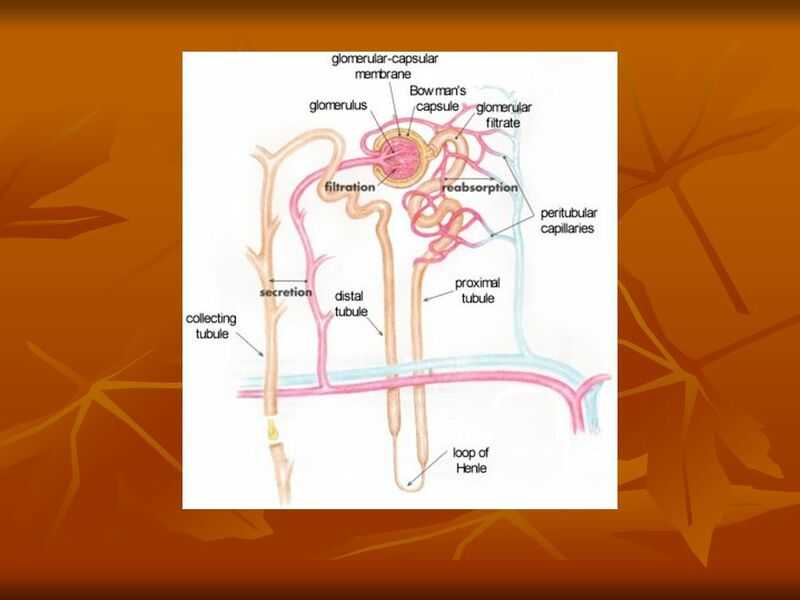 Production of Calcitriol by the cells of the Proximal Tubule of the nephron in the kidney is stimulated by hypocalcemia and hypophospatemia. 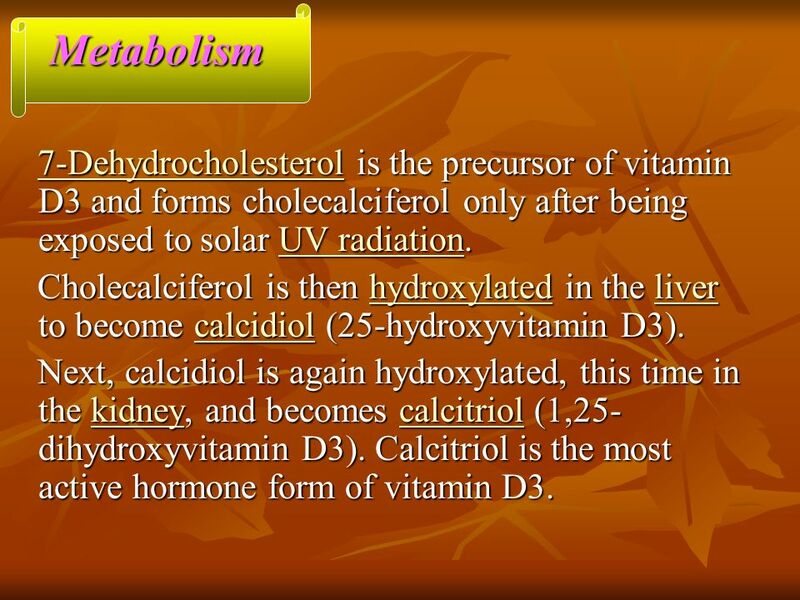 49 Metabolism 7-Dehydrocholesterol is the precursor of vitamin D3 and forms cholecalciferol only after being exposed to solar UV radiation. Cholecalciferol is then hydroxylated in the liver to become calcidiol (25-hydroxyvitamin D3). Next, calcidiol is again hydroxylated, this time in the kidney, and becomes calcitriol (1,25-dihydroxyvitamin D3). 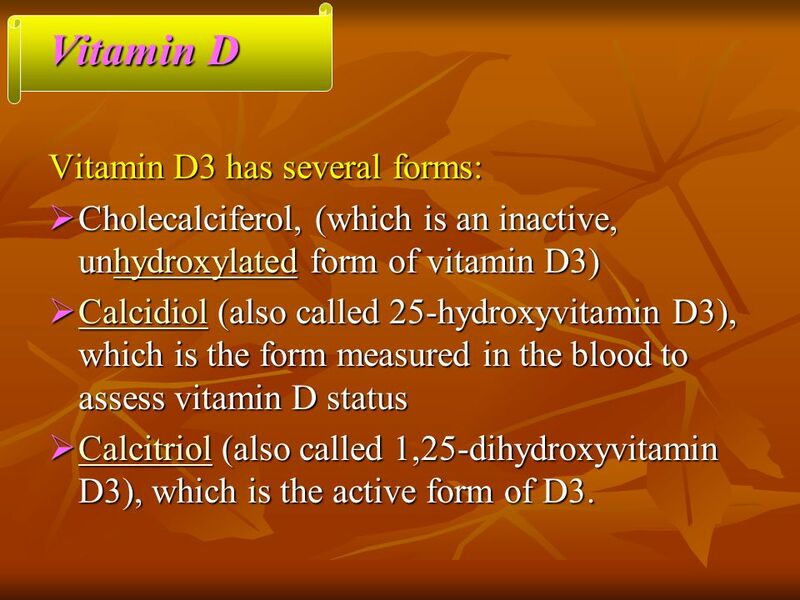 Calcitriol is the most active hormone form of vitamin D3. clearance Creatinine clearance test. 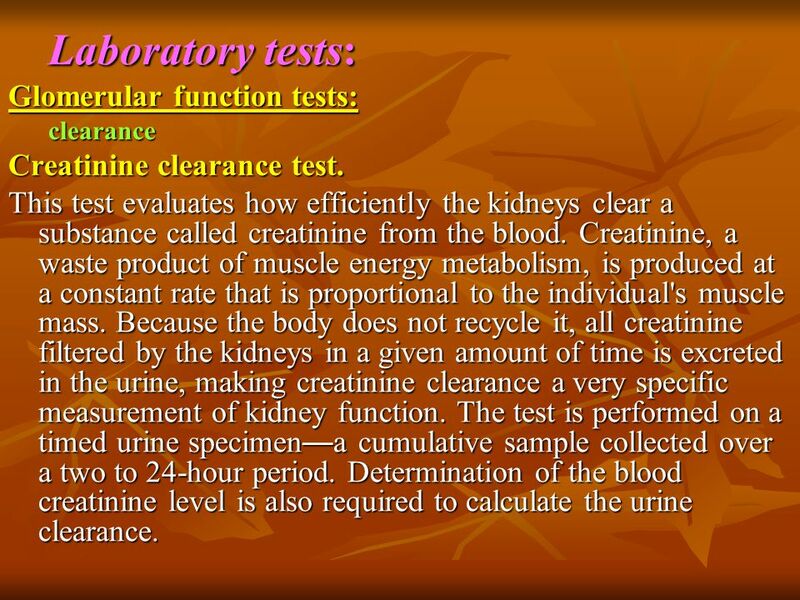 This test evaluates how efficiently the kidneys clear a substance called creatinine from the blood. 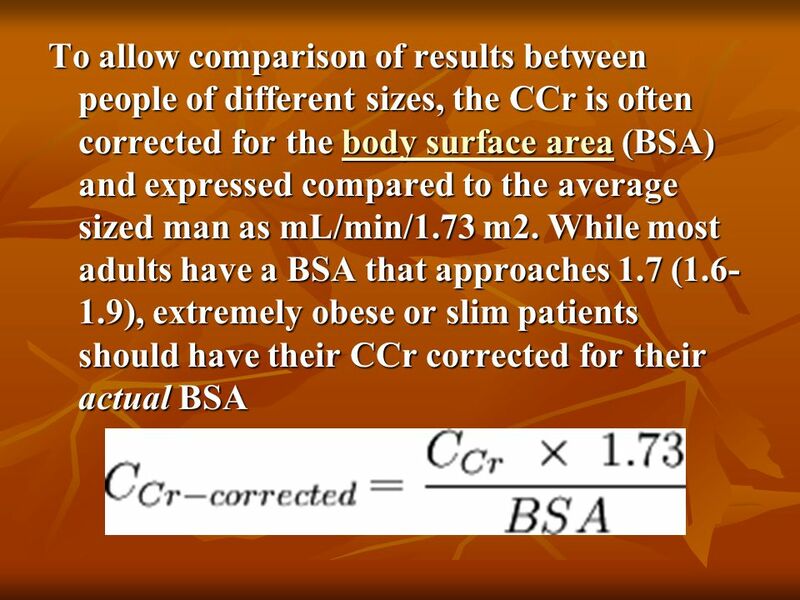 Creatinine, a waste product of muscle energy metabolism, is produced at a constant rate that is proportional to the individual's muscle mass. 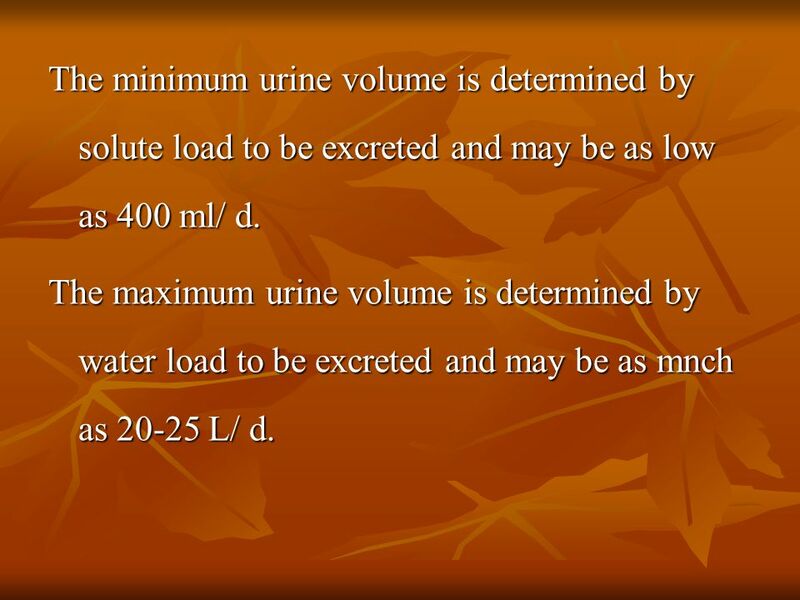 Because the body does not recycle it, all creatinine filtered by the kidneys in a given amount of time is excreted in the urine, making creatinine clearance a very specific measurement of kidney function. The test is performed on a timed urine specimen—a cumulative sample collected over a two to 24-hour period. 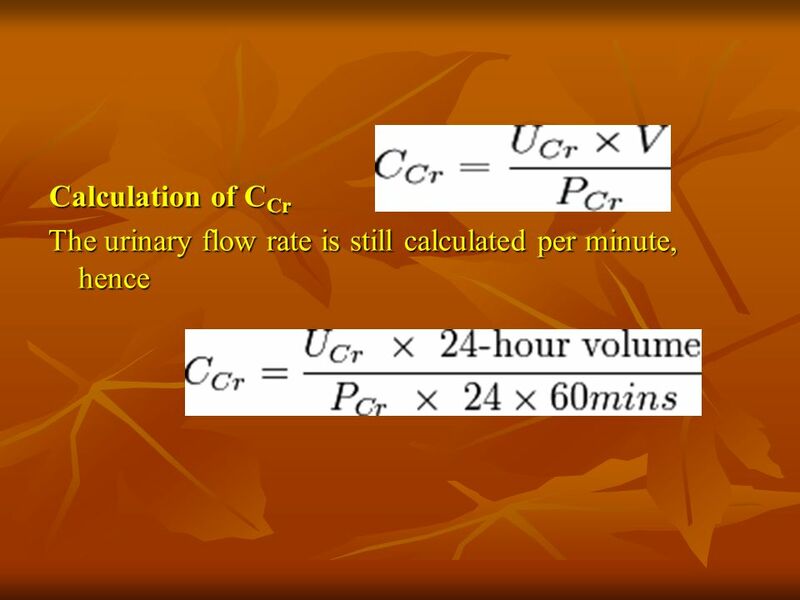 Determination of the blood creatinine level is also required to calculate the urine clearance. 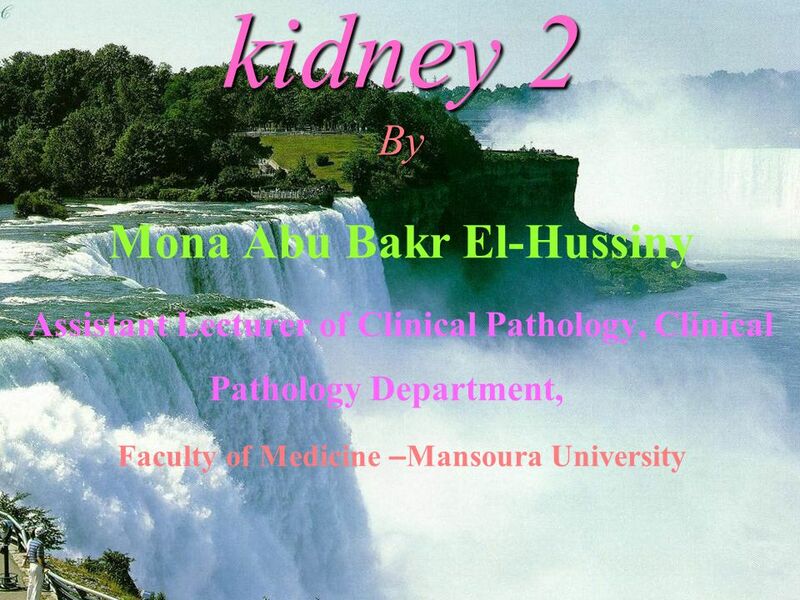 Download ppt "Mona Abu Bakr El-Hussiny Faculty of Medicine –Mansoura University"
FORM AND FUNCTION THE URINARY SYSTEM. 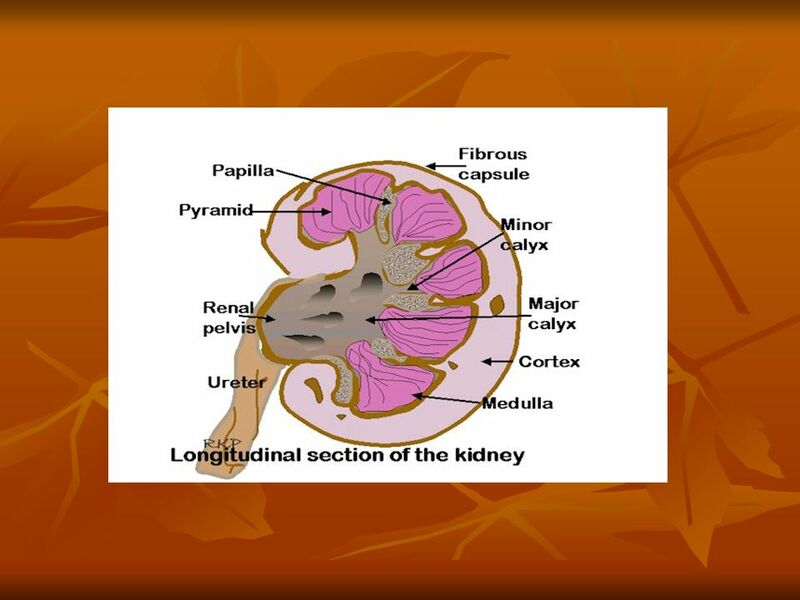 COMPONENTS 2 Kidneys 2 ureters 1 urinary bladder 1 urethra. Copyright © 2004 Pearson Education, Inc., publishing as Benjamin Cummings Excretion The removal of organic waste products from body fluids Elimination. Figure 3. 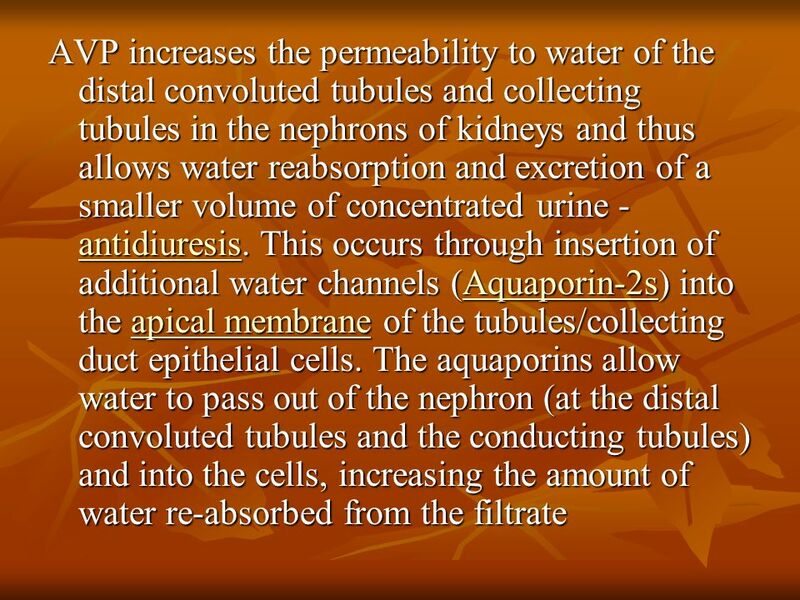 Urine formation takes place in the nephron. 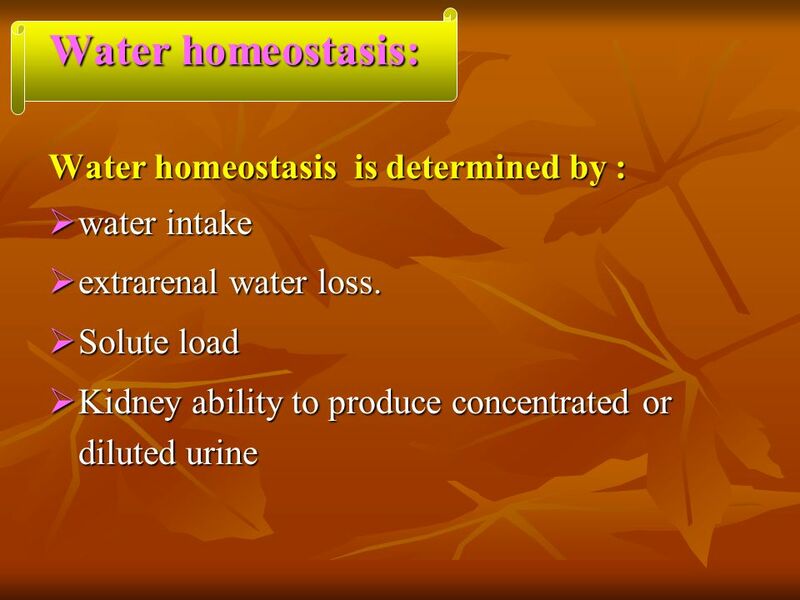 Urinary System and Excretion Organs Urine Formation Homeostatic Mechanisms.